This unit is subject to MAP Policy, and we are unable to advertise our price. Please click ADD TO CART to see our price. Clicking does not commit you to purchase. 3-Dimensional TVs add new depth and dimension to create larger-than-life experiences. 3D Active Glasses sync up with the 3D TV to produce 3D images that virtually leap off the screen. Favorite shows can even be transformed to 3D in real time for the ultimate "reality" TV. Real Black Filter enhances the plasma experience, day or night. The filter improves contrast so that every black shadow and detail is sharpened and well-defined by surpassing reflected external light. An ultra-crisp contrast remains with rich blacks and realistic images, even when viewing at night. Choose from hundreds of popular TV Apps to stream video, view pictures, play music and games, and much more. Get up-to-the-minute access to the hottest digital content, which keeps growing, from AccuWeather, Blockbuster and eBay... to Flickr, Pandora, Twitter and YouTube. Auto Motion Plus 120Hz™ brings action movies and sports to life in the living room, thanks to frame-to-frame smooth motion. This technology eliminates motion blur by calculating the image and inserting it, creating a non-repetitive transition from one frame to the next. In the 1920x1080 full high definition resolution, 1,080 horizontal lines create sharp details and crystal-clear, smooth motion for the brightest, boldest colors and realistic picture. The Samsung PN63C8000 Plasma flat-panel HDTV represents the best Samsung design innovation and performance found in their 2010 line of Plasma TVs. First impressions begin with an elegantly styled brushed metal gray cabinet that measures a mere 1.5-inch deep. Lighter in weight, more efficient than their previous designs, their feature innovations offer a more powerful Internet@TV with customizable access to Internet content, a convenient homenetworking capability via its DLNA standard connectivity, a high-speed USB port, and the new 3D HDTV viewing experience with optional Samsung 3D glasses. Picture performance refinements are aimed at delivering a very natural, film-like, highly detailed picture with deep black levels and brighter colors. Features also include Samsung's Cinema Smooth processing, Motion Judder Canceller and Real Black Filter. 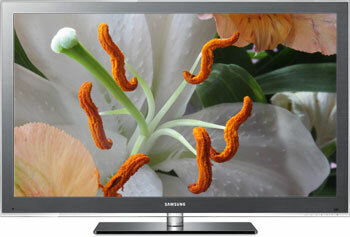 Line of Samsung HDTV models with a common set of features and capabilities. Design element that blends a hint of amber color into a TV's black bezel frame for aesthetic appeal. Speed at which pixels can change color. Lower response times mean better motion image reproduction. Ratio of the width of an display to its height. 16:9 is the universal standard for high-definition TV. Wi-fi Ready (requires LinkStick™ adapter) Connection that allows streaming audio, video, and other computer data across wireless networks. Capable of playing 3D video content, including movies and television programming. Feature that wirelessly syncs a PC and other digital devices to a TV for full screen playability. Mode in which a user can play video games on an LCD television. Technology that allows two or more programs to be viewed on one TV screen via inset windows. Function that seeks out available channels and automatically programs them for easy cycling. Function that caps volume on loud advertisements so that they're more consistent with programming. An internal receiver that enables a TV to utilize Digital Television technology. High Definition MultiMedia Interface. CEC ensures HDMI components can be controlled by one remote. The measurement, in inches (in. ), of the television from front to back. Technology that lets a TV display video in accordance with analog, digital, and cable transmission standards.